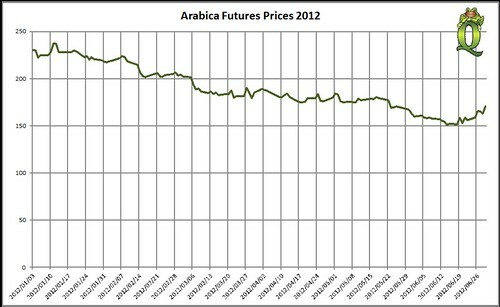 After last years massive jump in prices it was expected that the arabica coffee futures prices would start to settle down, and to a large extent they have. Even though Brazil and Columbia have held on to 2011 stock to try and prevent this slide, other market players have not kept stock. This trend will probably continue, with a small correction due to some of the coffee country boards showing concern over the 2012 crop. The Indonesian area specifically has not recovered from the 2011 shortfall, and their weather has not helped this year. The retail prices of green bean lag by about a quarter, and we are hoping that in the later end of the year we can reflect this decrease in a small enough manner, so that our clients can benefit. This even though most of the coffees we sell are bought a a premium above the indicative futures price.